I don’t think I have ever come across his books, and I’m not sure I’ll be in a rush to find them. Though I am a little curious about how many copies are still around, and whether he’s still read. I wonder if he is still read? I suspect so; recently I came across some brand new re-issues of some of his titles, all done up with appealing front cover artwork and even, I seem to remember, scholarly forewords. Lots of old copies still to be had; we’ve accumulated a fair array over the years rather effortlessly as they show up for pennies at the charity shops and book sales. Some hardly touched in pristine dust jackets, others tattered from obvious repeated readings. Well, not really a writer of the top rank (sorry, Hammond Innes!) and you’re not missing any hidden gems here. 😉 But good for occasional dipping into; he does hold the interest, though I admit to frequent silent groans at some of his more outrageous (though era-appropriate) statements. I haven’t read him, but perhaps if there’s one where “I… sit back and wait for the book to come to me” (great review! – actually both review excerpts are deliciously mean. Shouldn’t like that, but, of course, how can I not?!) then I should. I have been thinking of re-reading some Alistair Maclean of late, though I would have to go through some boxes to find them – now he was good with settings *and* decent plot carry-through. He’s good for an occasional diversion, I find, though a little of this sort of thing goes a long way. There is some grand writing, but then he just walks all over it by his insistence on dramatic! action! over logical plot progression. But I have a fondness for the man, nevertheless. Hammond Innes’ faithful descriptions of geography, travel, and the technology of the day is what keeps me plowing through his books at an enjoyable pace. The story in each book appears easily enough if you don’t fret over it. Just sit back and allow yourself to be transported. I don’t know what I will do when I am through them all except for his first four books which are out-of-print. Very readable, this author. I revisit his works on occasion and though I allow his more blatantly opinionated statements and occasional logical bloomers to annoy me, I mostly just suspend the inner critic and enjoy the tales for what they are. Have you read Harvest of Journeys, his memoir? I haven’t read it for many years, but remember it as being absolutely fascinating. “Harvest of Journeys” is on my shelf, having thumbed through it some time ago and decided it not “ripe” yet for the reading. But thanks for reminding me for I now see that I have gone past where it should have been inserted chronologically in my “Hammond Innes” reading order. I started with “The Trojan Horse” (1940) and am now midway through “The Strode Venturer” (1965). 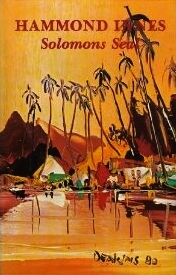 “Harvest” was finished in 1960 covering journeys corresponding to many of his novels written in the preceding decade. It would be a good time to read his background memoirs of scenes introduced in the stories I’ve recently read.